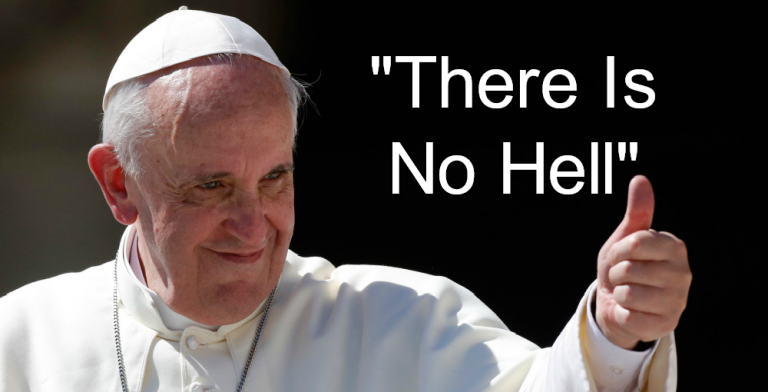 ProTip – There’s no heaven either: Pope Francis declares “There is no Hell” and the Vatican panics, denies the claim, and reassures the faithful that sinners will burn for eternity. Speaking with respected journalist Eugenio Scalfari, the founder of one of Italy’s leading newspapers, La Repubblica, Pope Francis explained that there is no Hell, and that sinners will not be punished for eternity. Your Holiness, in our previous meeting you told me that our species will disappear in a certain moment and that God, still out of his creative force, will create new species. You have never spoken to me about the souls who died in sin and will go to hell to suffer it for eternity. You have however spoken to me of good souls, admitted to the contemplation of God. But what about bad souls? Where are they punished? The Holy Father Francis recently received the founder of the newspaper La Repubblica in a private meeting on the occasion of Easter, without however giving him any interviews. What is reported by the author in today’s article [in La Repubblica] is the result of his reconstruction, in which the textual words pronounced by the Pope are not quoted. No quotation of the aforementioned article must therefore be considered as a faithful transcription of the words of the Holy Father. Bottom line: After Pope Francis declared “There is no Hell” the Vatican panicked, and issued a correction, reassuring the faithful that sinners will burn for eternity in Hell. Because, after all, what’s the point of being a Catholic or a Christian if you can’t enjoy the thought of other people suffering for eternity?